These Snacks For Breastfeeding Moms are easy to make ahead of time and are healthy recipes to help keep your body fueled and energized while nursing. Today we’re tackling some topics I don’t get into very often on the blog – weight, calories etc…specifically as they relate to breastfeeding. As many of you may remember, I only breastfed Squish for six weeks and I was really sick during most of that time. I gained about 25 pounds while I was pregnant with him and I lost all 25 pounds, plus 15 more in the six weeks after he was born. This was fairly drastic and obviously not the norm. It also didn’t give me any idea how exclusively breastfeeding for an extended period of time would affect my body. Little Miss and I have successfully survived over 3 months of breastfeeding. I lost most of the 25 pounds I gained with her in the first 2-3 weeks and am now currently focused on maintaining my weight. Although my weight fluctuated a lot during high school and college, once I graduated and learned how to eat things besides Cheerios and bagels, I figured out my set point weight and have maintained it for the past 10 years or so thanks to a fairly balanced diet, exercise and intuitive eating. I know about how much I have to eat each day to maintain my weight. 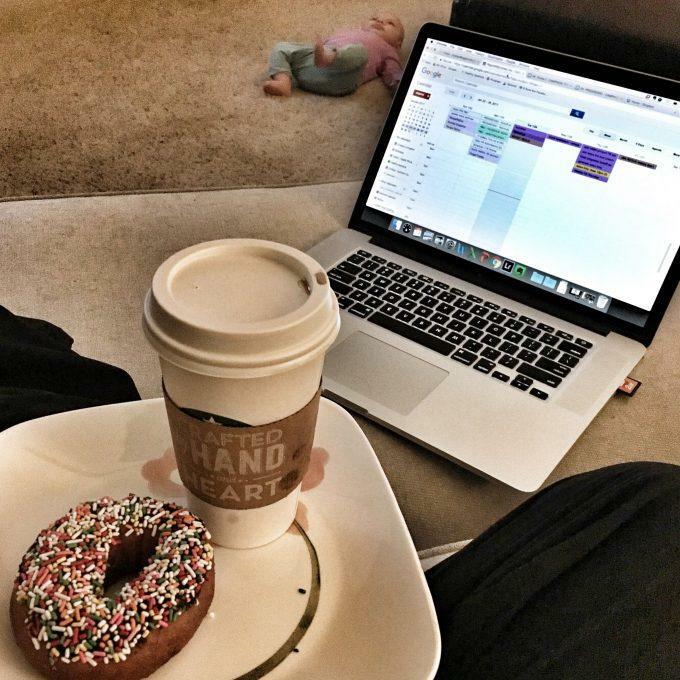 While I don’t count calories….if you’re looking for a number, it’s definitely north of 2,000 calories per day. When I add in CrossFit (weightlifting and high-intensity workouts), which I do for lots of reasons…one of which is not currently weight loss…I have to eat more to maintain my weight. Now I’ve also added exclusively breastfeeding into the mix. Breastfeeding women are encouraged to eat extra calories (anywhere from 300-500 per day on average). If you’re still following along here, that means that right now, I have to eat a lot. And some days I struggle with it. I’ve never really been someone who enjoys eating huge meals. I prefer smaller meals + snacks throughout the day…which is fine…except finding the time to eat all day long can be tough when you have a screaming newborn and a high-energy toddler running around. Lately I’m often trying to shove something in my mouth while nursing one kid and getting food for the other. And when I do have a chance to sit down and eat I’m either too tired or too indecisive or nothing sounds good, etc. Both Squish and Little Miss are screaming to eat…so I walk around the kitchen nursing her while getting food for him, dipping his food in ketchup, picking up the napkin he threw on the ground for the 1ooth time, etc. Squish is screaming to eat and Little Miss is sleeping…so I feed him and then run around the house trying to take advantage of the fact that she’s sleeping by doing a million other things like folding laundry, emptying the dishwasher, writing blog posts, taking photos etc. Both kids need fed, so I feed them. Then Squish goes off to play. I attempt to eat something and he somehow ALWAYS hears me and makes a beeline back to the kitchen so I give up and decide to try again later because I don’t feel like arguing with him about why HE can’t eat again. Obviously, there are times when I do sit down and eat when he’s eating or I grab a snack without him noticing or I let the baby cry for a few minutes longer while I eat, or I eat with one hand once I’ve given him his food…but not always. Side note- hubby usually gets Squish up in the morning and gets him breakfast while I feed the baby, which is helpful and when he’s home for lunch he helps out too….but there are still a lot of meal and snack times when I’m on my own. A couple weekends ago, I reached a bit of a breaking point. I’d done a few tough workouts, paired with a few unintentionally skipped meals and I was so hungry I could barely function. I complained to hubby and we took a break from our errands on Saturday to eat meatballs and loaded tater tots. I ate a donut with dinner that night and another for breakfast on Sunday…and then an entire double chicken burrito bowl with guacamole for lunch because I knew I needed the calories. Do I regret or feel guilty about eating all that? No. The point to all this is that I realized I need to step up my game a little bit. 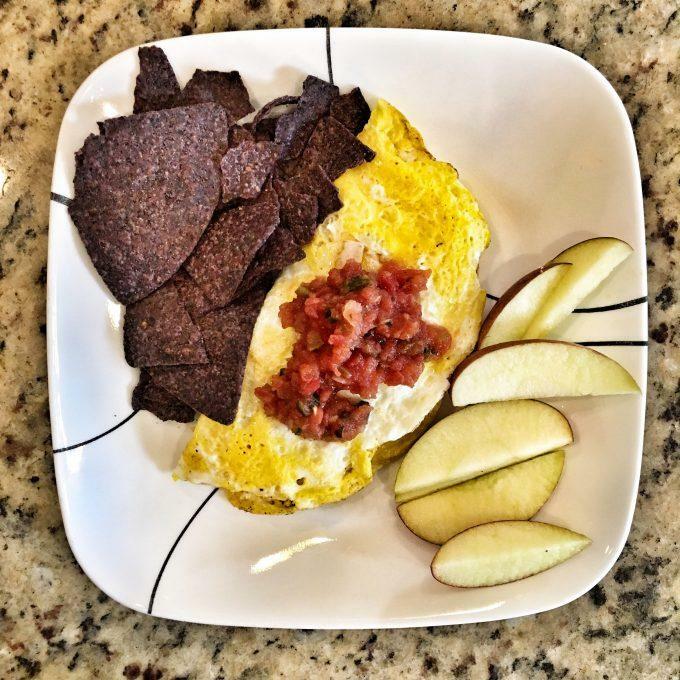 I need to make more of an effort to have my fridge, freezer and pantry well-stocked with healthy, calorie-dense snacks that I can eat quickly throughout the day and I need to prioritize sitting down and eating meals….even when I’m busy or feel like I have a million other things to do. I buy a big bag of trailmix from Costco that has peanuts, almonds, cashews, raisins and m&ms but it’s just as easy to make your own with all your favorite things in it! Think nuts, seeds, popcorn, dried fruit, chocolate chips, cereal, bite-sized crackers etc. 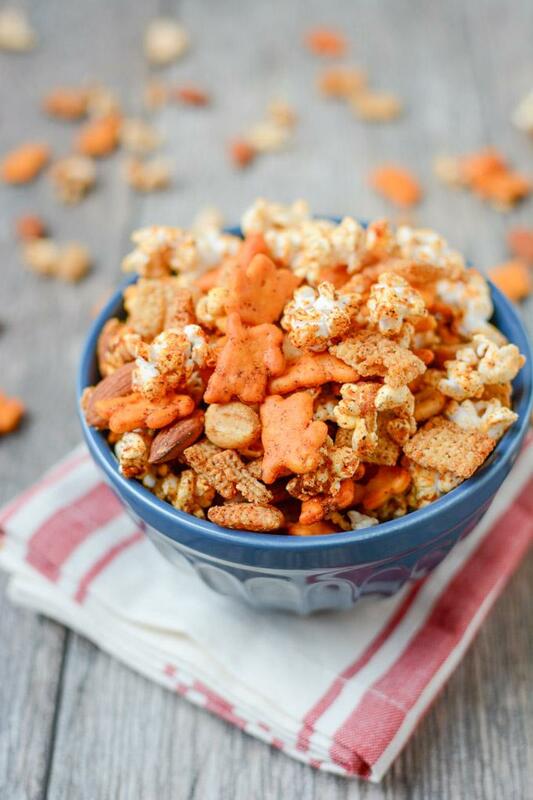 Or try this Popcorn Snack Mix. 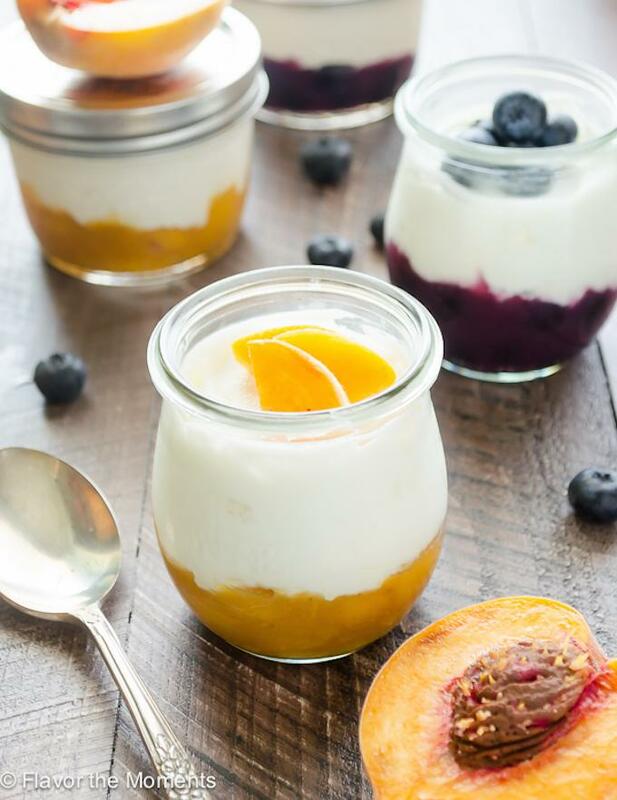 Try full-fat plain yogurt or Greek yogurt and top with a handful of granola, cereal or fresh fruit and nuts/seeds. Or make up a few jars of Homemade Fruit on the Bottom Yogurt to eat throughout the week. These are so easy to make and perfect for stocking your freezer. Make a double batch and freeze them so you can pull out one or two out to eat quickly. 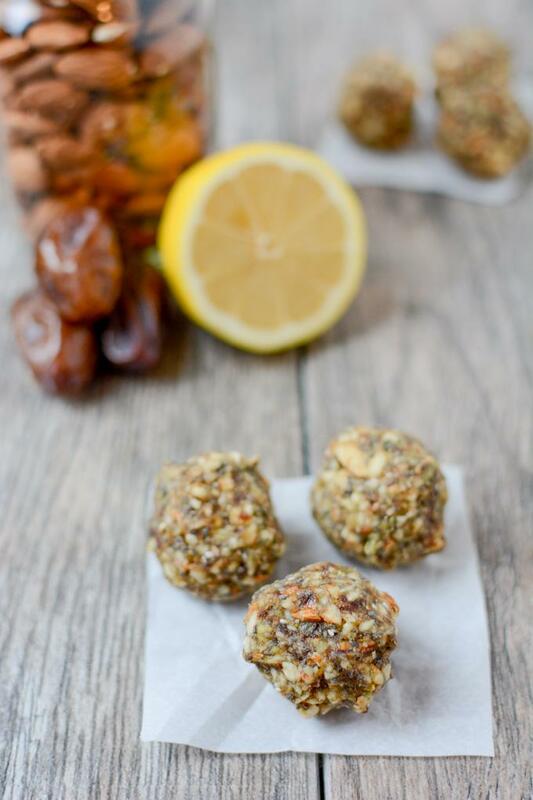 Try these Lemon Energy Balls or these No Bake Peppermint Chocolate Bites. 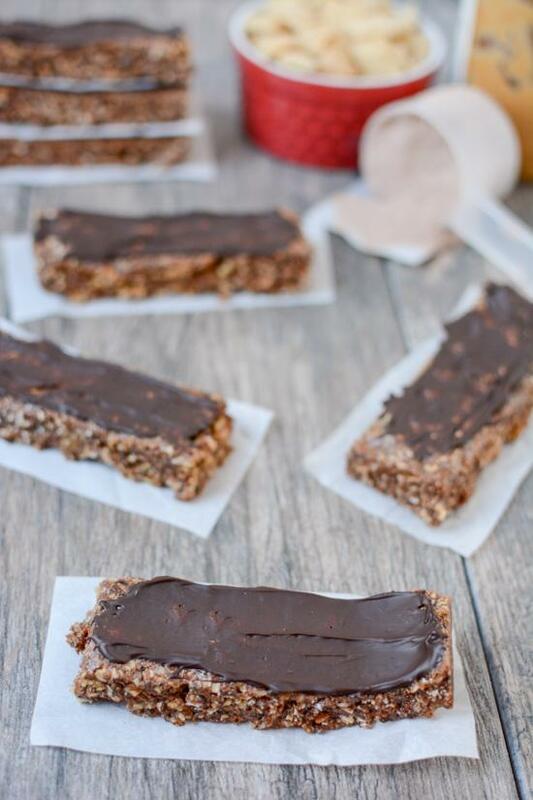 I make these No-Bake Protein Bars all the time. If you don’t want to add protein powder, try these No-Bake Peanut Butter Granola Bars, these No-Bake Blueberry Almond Bars or these Sweet Potato Protein Cookies. I’ve been eating a couple of these each day for a quick snack or dessert. 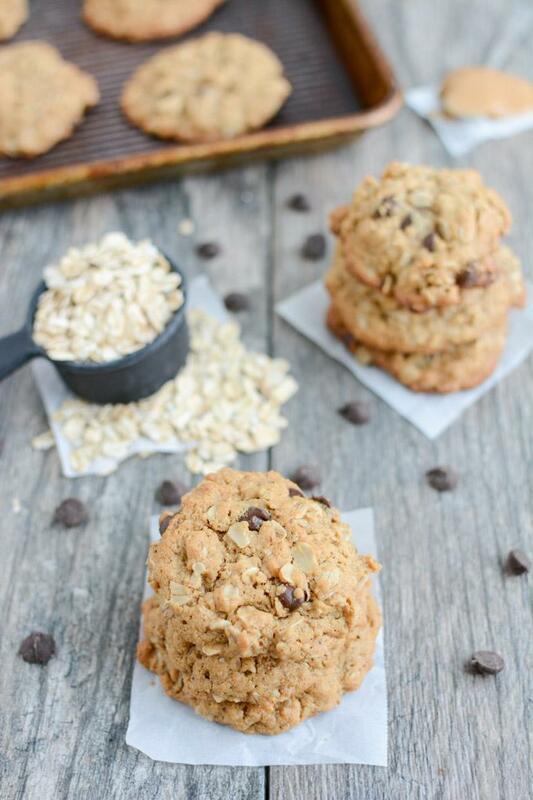 This is my recipe for Dairy-Free Lactation Cookies and there are tons of other variations out there! 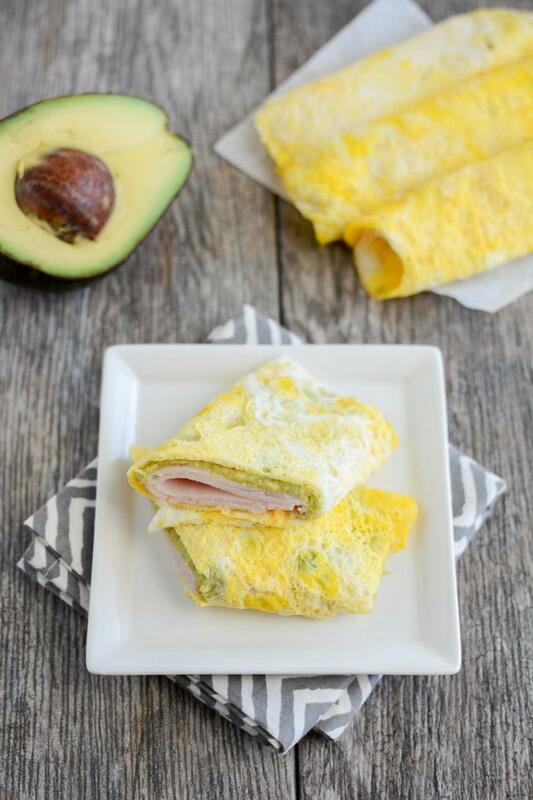 I’ve been loving these egg wraps with turkey and guac or hummus. I make up 8-10 on Sundays to have on hand throughout the week. 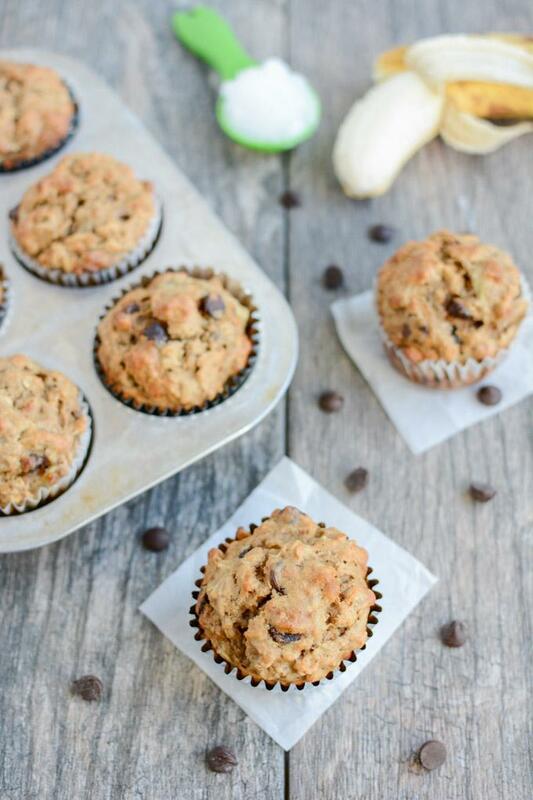 My current favorite are these Coconut Oil Banana Muffins. You could also try these Sweet Potato Bites , Peanut Butter Banana Oat Muffins or these Healthy Chocolate Muffins. That’s all for today! 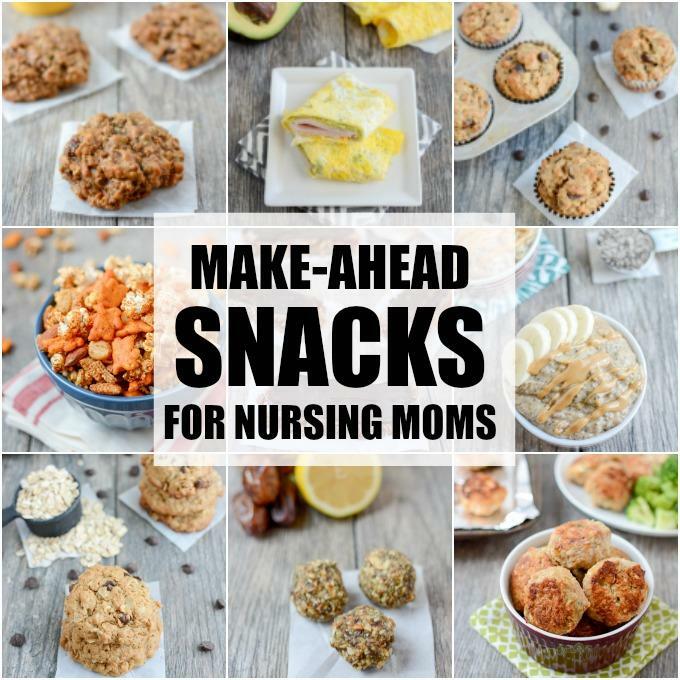 Keep in mind these healthy make-ahead snacks are great for everyone, not just nursing moms! What’s your favorite make-ahead snack? Do you eat larger portions than you snap or more calorie heavy snacks throughout the day? I’m always amazed (/jealous) when people can do hard workouts and eat small dinners. i eat a lot more than is shown on social media. a great reminder to not compare yourself to what you see from anyone on social media! like i said, i’ve never been able to eat super big meals…so i often eat a snack right when i get home or while making dinner, then dinner and then eat again before i go to bed. it just works better for my body than having one giant meal after a workout! This is such a struggle for so many of my clients! To the point that they actually think there is a reason they can’t gain weight, and it’s simply lack of sufficient calorie intake. The calories needed are high! Especially if you had a fast metabolism to start! This is a great post! As a soon-to-be-first-time-mom, this couldn’t have come at a better time. Thank you so much for this. A few questions: could you make the muffin mix ahead of time and bake as needed or would you need to bake as you make the mixes? Could the same apply to the lactation cookies? you can mix up the cookie dough, scoop it into balls and freeze them on a cookie sheet. once frozen, put them in a ziploc bag and then just pull out a few to bake when you want to. for the muffins i would bake them like normal and then once they’ve cooled you can wrap them in plastic wrap and put them in a ziploc bag to freeze. just pull a few out and let them defrost on the counter or in the microwave when you want them! Such a hard thing for new moms to grasp because everything tells them they need to lose the baby weight, etc. I’ve BF 4 babies (now 1, 3, 5, and 8), and I’m sure my supply suffered with the last two because of lack of time and struggling to maintain my weight. Lots of eating as you go and lots of oatmeal, in all forms imaginable! yep! gimmme alllll the food! Where is your egg wrap recipe? Those look soooo good!! I also have a hard time getting enough in and I’m not even breastfeeding I’m just trying to get pregnant!!! just added the link in the post. sorry! and good luck! Omg, I gained SO much weight on maternity leave. No time to eat meant poptarts for snacks and sometimes nothing but half a loaf.of bread to get me through the day. If we have a second kiddo I am definitely packing myself grab and go meals and snacks for the next day, just as if I were going to work! Hang in there and keep the quick eats coming! My little girl is almost 3 months old and I’ve had to turn my diet around completely trying to work out what’s best for her colic (week 3 of no dairy currently & 9 weeks of clean eating). Your sweet potato protein biscuits & protein balls are amazing to snack on and have helped me stay on the healthy track being easy to make and so great to have easily accessible! Is there a link to the egg wraps, I’m on my phone so I can’t see it. Thanks so much again from South Australia! so glad to hear it! just updated with link to egg wraps! hang in there mama! hang in there mama! prep alllllll the snacks! I can TOTALLY relate to you right eatif dilem a! I just had a baby girl and have a busy 1 1/2 year old daughter as well. I really struggled this pregnancy with hypoglycemia towards the second half. People kept commenting hat I didn’t look very big and should gain more weight, etc. I literally was trying SO hard and did my best. 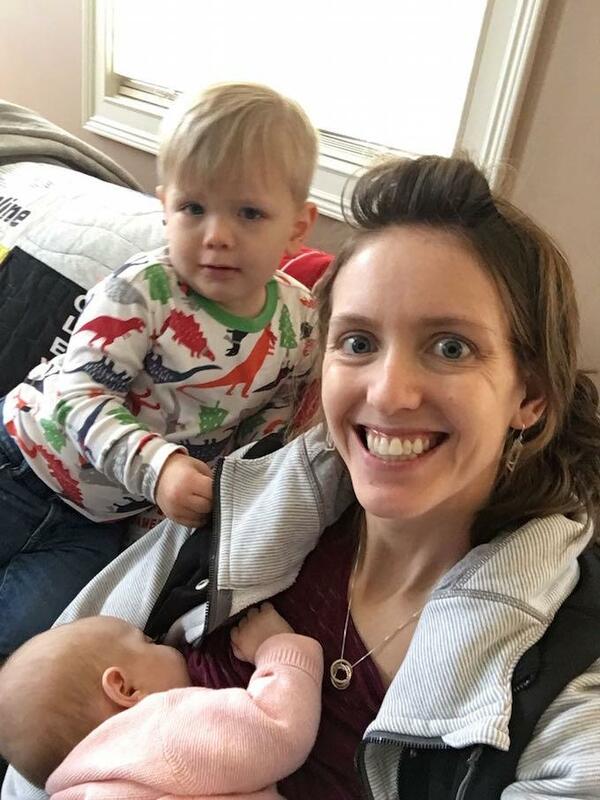 And since the new baby, I have still struggled to think straight about what sounds good and/or find the time without someone else crying to eat what I finally made myself… the struggle is real! All your recipes sound amazing and I’m so glad I found you! This is amazing! Thank you for this list. I have just gotten into meal prep and it’s going to help so much more with the next baby! Wow his sounds exactly like me! I’m struggling to maintain my supply with second bub and know I never had enough for bub number 1 and I think not eating enough has been a huge factor… i think I need to spend a few days loading up the fridge and freezer. Thank you for the helpful ideas. I think the other factor is rest but who hasn’t time with a toddler and 4 month old!